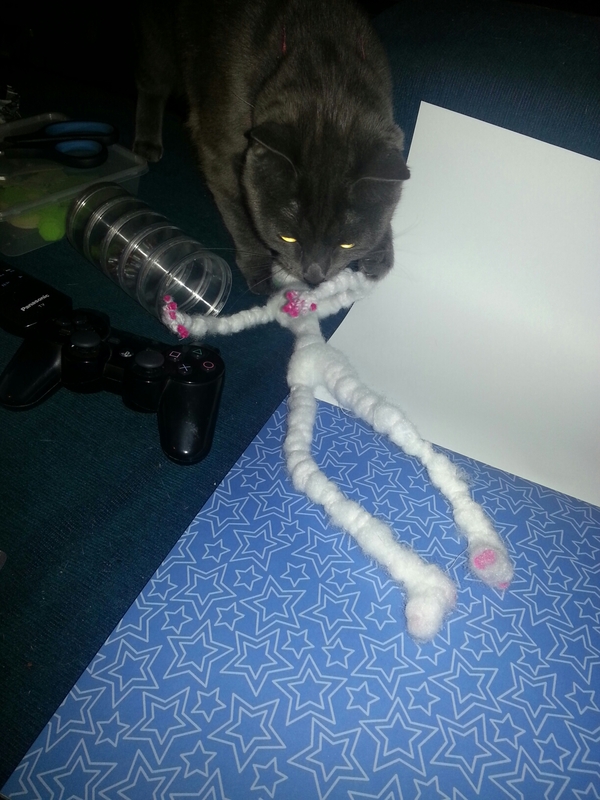 My doll is slowly evolving… And quickly being stolen by our resident kleptomaniac. I was watching videos on YouTube about needle felting. There was one from Threadbanger’s ‘Man vs Pin,’ which you can watch here. There is Blood and swearing warnings. that I don’t want to lose. Perhaps to keep it going, I can make practice pieces, like I did for the eyes, but with lips, nose and hands. Today I made an eye-ball. It’s a thing of nightmares, but it was all about the learning. After a while, I was just having fun. I might even add more eyes. When I was learning clay sculpture, my teacher got us to make a practice piece of facial features individually, which helps focus and practice without worrying about wreaking a large piece. This can be used for most arts. This project was about learning how to put felt eyelids around beads to make it look like eyes. The character that I’m basing the figure on has completely green eyes, that’s why I didn’t bother painting irises and pupils on beforehand, as I don’t need to practice that yet. 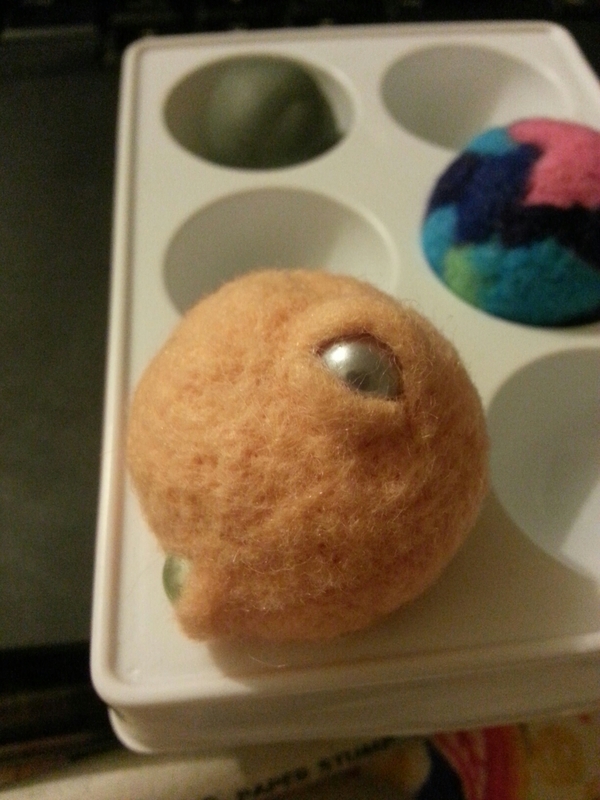 Basically, I felted a ball, stitched pearl beads into the ball and pulled tightly, so they were slightly inset. I then experimented with folding felt and laying it on, using one layer, putting the bottom lid on first, the tried the top lid on first. Most of them looked sleepy, until I figured out that I had to push open the bottom lid nearly all the way. One had a bit of space between the lids, so I stuck some pink in for the corner of the eye, but it was too bright and looks weird. One eye has eyeliner added in pen, which made me want to experiment with shading and colouring. This might define it better, perhaps even adding glue to the areas that came out a bit fluffy. Maybe I could try painting some eyes on, if all else fails. Instead of showing you painstakingly slow progression pictures of my needle felting, I thought I’d show you how that yarn, that I bought, knits up. 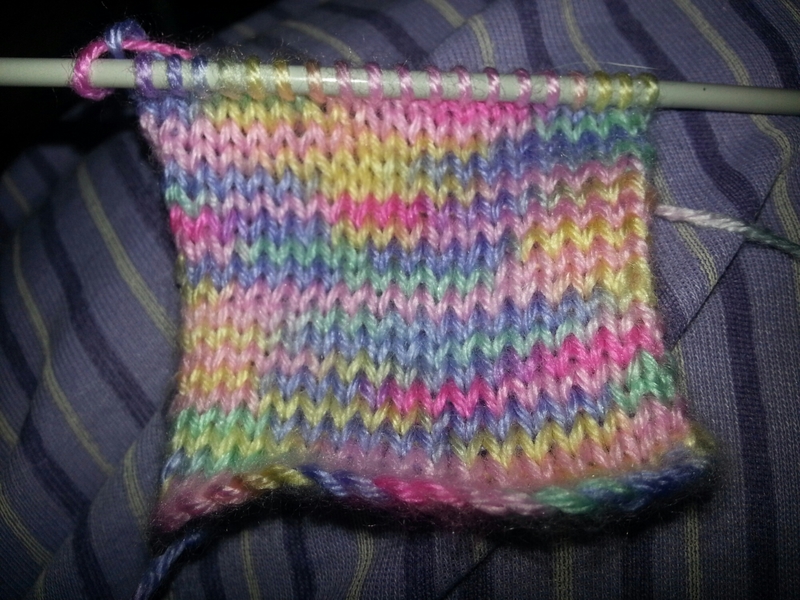 It’s 4ply soft baby yarn (which looks a bit softer in colour than this), and using 3.25mm needles. Most of my knitting needles are on unfinished projects, or half in another dimension, so it’s rather slim pickings at the moment. 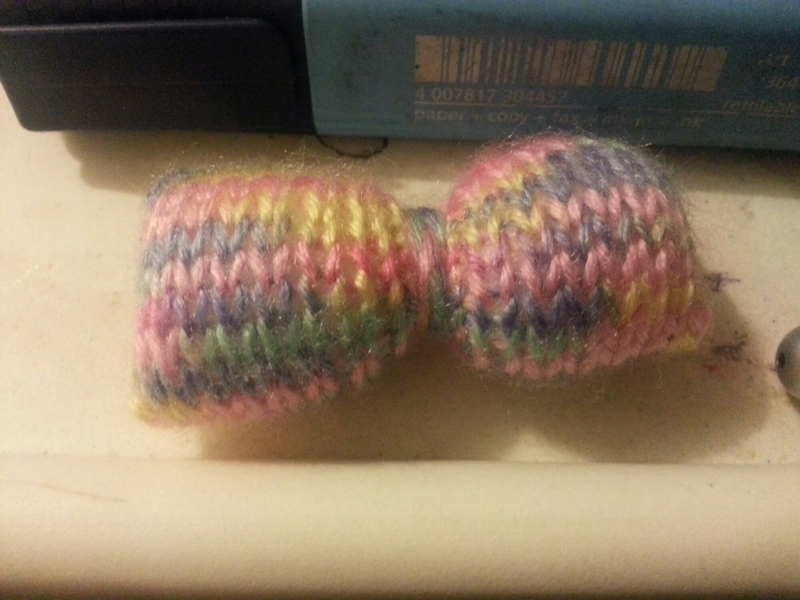 I decided that I would make a small, puffy, knitted bow for a headband, as it didn’t need a pattern. Knit a square, sew into tube, sew ends of tube, after stuffing, and wrap middle with yarn. 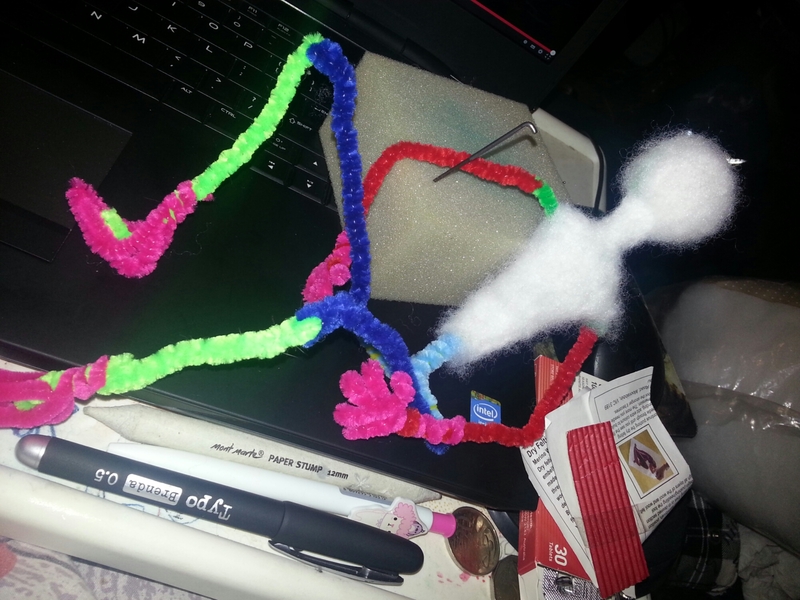 To update on the needle felting, I did a fair bit of the legs. They still need so much work done, but they are mostly blocked in. There is absolutely no way this figurine will stand up by herself at the moment, and will need a whole load or wire to do so. Now would be the time where I decide to let her sit, or wrap her in wire before she gets too bulky and I can’t add things without them showing on the outside. I suppose I could use a doll stand that are used for displays. 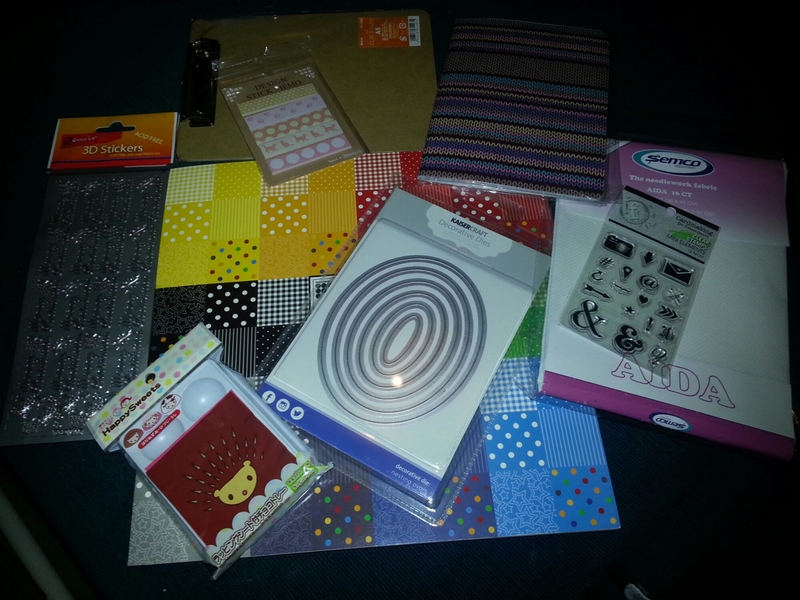 I maaaaay have gone shopping again. I found some black crochet cotton, which is surprisingly hard to find whenever I need it, so I picked up a ball. I realised later that I could make some more gloves whenever I get around to making the pattern. Trying to balance between all the crafts and video games is rather harder than I thought. But it’s all fun, so I can’t complain yet. I picked up a few pipe cleaners/chenille stems for making armatures for a needle felting idea I had, then I got home and found an extra packet full. I found an image the other day saying “Life’s short, buy the yarn,” so I went and bought a ball that I had my eyes on a few weeks ago. 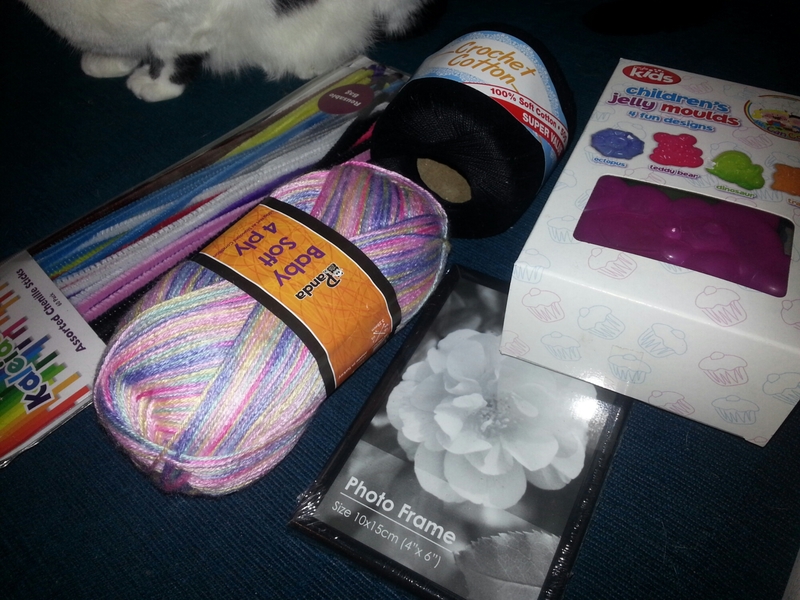 I have either used or lost a bunch of my stash of wool without realising, so it’s okay, I’ve decided. Also, it knits up so pretty. I got a small photo frame that I wanted to trial as a small write on/wipe off board. I am sure I wanted to get more photo frames for the glass, but I can’t remember why. In the variety store, I found some jelly moulds. I thought they might be good for resin, but when I looked at them, the plastic is too hard and there isn’t much detail, but this would make perfect plaster of paris moulds. Not that I know any kids, but this would be great for painting with them. Before I began, I had to create a needle proof glove, that I had seen online, and since I had used the right hand of these gloves for a tablet glove, it worked out perfectly, as I needed a left hand glove. Basically all you do is put your hand in a position to hold the wool in, and wrap your index finger and thumb in duct tape. It works a dream! No tetanus, although it did get a bit sweaty and cramped up due to not being able to move the fingers much, but no tetanus. The first idea involved felt dolls, and I was thinking about covering obvious seams by needle felting a piece of matching felt over it. Then I thought of sculpting the felt head after it’s stuffed. Then I thought (all in a short amount of time) that I could try felting toy stuffing, as it’s cheap enough to practice on, and I could make the bulk of the item in that, and cover in the expensive/coloured wool or felt. 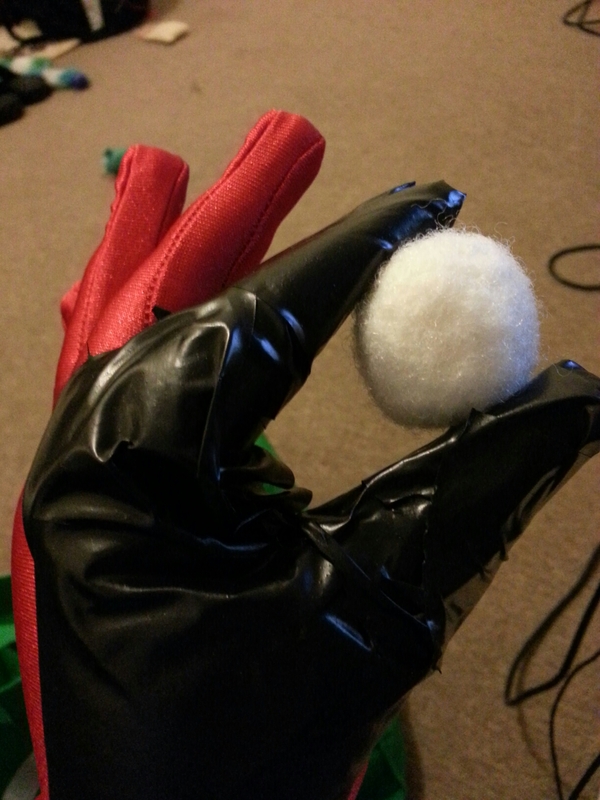 It worked just as well as the wool, and with the glove it all came together very easily. 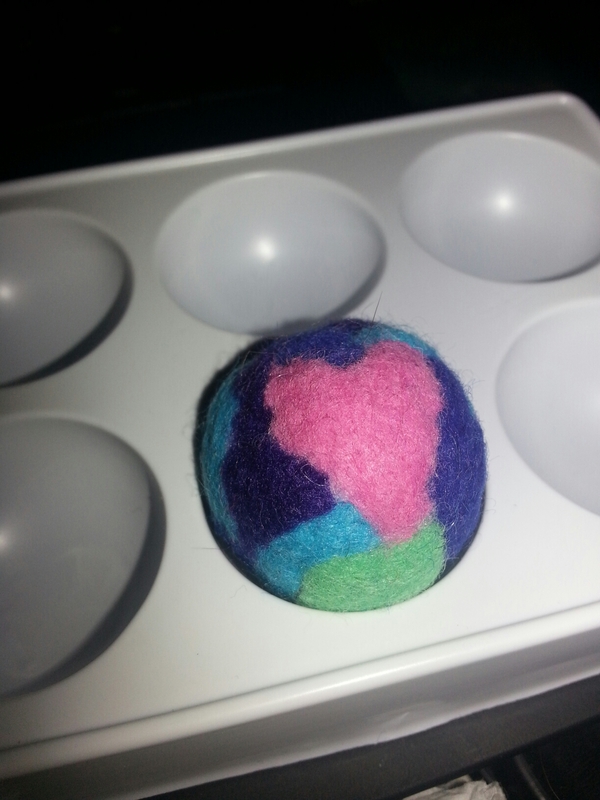 I wanted to see how tight I could get the ball by just felting. I didn’t finish, but there was quite a large handful of stuffing when I began. This could possibly make a nice centre for a play ball for kids. Since toy stuffing is generally kid friendly, and covering with fabric shouldn’t be too hard, also you can make it larger and softer for babies, or harder for older kids and pets.